This collection of fake people quotes and sayings highlights many of the things folks don’t like in personal qualities. Remember, it’s best to hate the behavior and not the person. The attention that this type of person receives has risen to new heights in today’s society. Some can become so accustomed to their second face that they start living lives of lies. They find it increasingly hard to tell what is true and what is not. Their action can harm friends and family, but long-term, it’s usually most harmful to themselves. Here are some sayings to shed some light on what can be at times a troubling topic. When in doubt, pay more attention to what people do and less to what they say. Actions not only speak louder than words, they are more difficult to fake. When you see the genuine, you don’t deal with the fakes anymore. At the end of the day real situations expose fake people so pay attention. Don’t be fooled by their mask. Fake people eventually show their true colors. Just wait until their mask needs cleaning. What’s the whole point of being pretty on the outside when you’re so ugly on the inside? When you are gunning to be like other people, you are foolishly repeating their mistakes, and the worst of it all is that you can’t even correct yours. Fake friends are easy to find and easy to lose, but real friends are the hardest to find and hardest to lose. I would rather have honest enemy rather than fake friends. Fake people have no identity; they are just a number, not anywhere near a comma. A fake friend is an enemy in disguise. …Share your hard moments. Share your real side. It’ll either scare away every fake person in your life or it will inspire them to finally let go of that mirage called perfection, which will open the doors to the most important relationships you’ll ever be a part of. And you don’t have to care, so don’t pretend. Nobody needs a best fake friend. An insincere and evil friend is more to be feared than a wild beast. A wild beast may wound your body, but an evil friend will wound your mind. 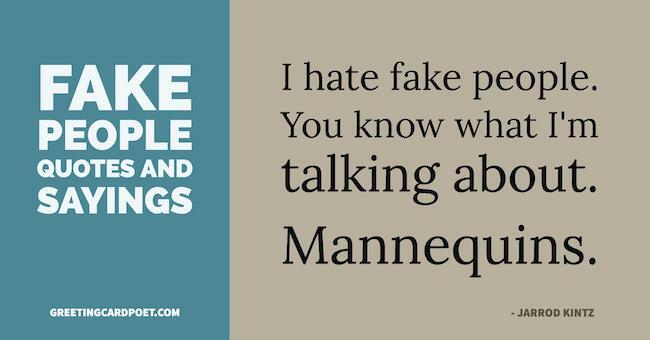 Tip: some of these fake people quotes should be used with care. Just be truthful – and if you can fake that, you’ve got it made. I despise the rituals of fake friendship. I wish we could just claw each other’s eyes out and call it a day. I despise the rituals of fake friendship. I wish we could just claw each other’s eyes out and call it a day; instead, we put on huge radiant smiles and spout compliments until our teeth hurt from the saccharine sweetness of it all. Fake friends are like shadows: always near you at your brightest moments, but nowhere to be seen at your darkest hour. True friends are like stars, you don’t always see them but they are always there. A friend who stands with you in pressure is more valuable than a hundred one who stand with you in pleasure. I’d rather eat crumbs with bums, than steaks with snakes. You don’t lose friends because real friends can never be lost. You lose people masquerading as friends, and you’re better for it. Sweetie, if you’re going to be two faced, at least make one of them pretty. Don’t fear the enemy that attacks you, but the fake friend who hugs you. People will stab you in the back and then ask why you’re bleeding. When folks are two faced, the only thing you know for sure is that you can’t depend on either of them. Bad people remind me of pennies – two faced and not worth much. I learned to identify the false love from true ones by their fruits, humbleness and how free they were from worldly desires. If you have any suggestions for quotation additions, please let us know via the Contact page. Thanks!